The Zapatista 2012 calendar is now for sale. 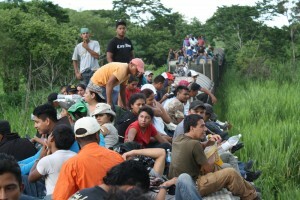 The calendar is published jointly by the Edinburgh Chiapas Solidarity Group and Kiptik in Bristol. All sales go to health and drinking water projects in Zapatista communites. Send us an email to arrange buying your own: £6 each. The calendar is also available from AK Press UK. It's a useful tool for planning the day-to-day of The Movement in 2012, as well as an artefact of history in the making. The calendar celebrates key Zapatista dates such as the anniversary of Comandanta Ramona's death (6 January 2006), and the first day of the 'March of those the Colour of the Earth' (25 February 2001). It is a practical example of telling our own stories and defining our own identities. Celebrate Zapatista autonomy every day of the year with this calendar. 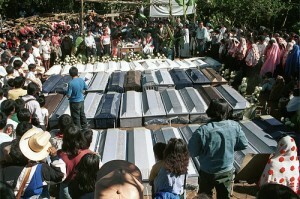 Mourners in the aftermath of the 1997 Acteal massacre. Confronted by this grave situation faced by our comrades in the Zapatista support bases in several communities, it was agreed at the last meeting of the Network against Repression and for Solidarity on 25 June to have a Brigade of Observation and Solidarity with the Zapatista Communities, which will take place from August 27 to September 3. They call it the beast. Innumerable tons of creaky iron that creep from the border of Mexico and Guatemala toward the north.